Authored and endorsed by the National Association of Pediatric Nurse Practitioners (NAPNAP) and the Association of Faculties of Pediatric Nurse Practitioners (AFPNP), the Core Review for Primary Care Pediatric Nurse Practitioners book accompanies the Core Curriculum for Primary Care Pediatric Nurse Practitioners. 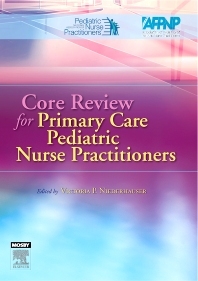 This core review provides practice questions for recent graduates for both pediatric and family nurse practitioner programs to use in their respective certification exams offered by the PNCB and ANCC. Review questions include the Role of the PNP, Wellness Issues, Growth and Development, Genetics, Chronic Conditions, Pediatric Emergencies, and Pharmacology.